Thought for the week: Pray when you feel like worrying, give thanks when you feel like complaining and keep going when you feel like quitting. Saturday night I went on the Hardin County Special Olympics fundraiser casino trip to Horseshoe Bend Casino with Sandy Ray, Pat Ray, Mike Ray, Tina Ray, Lucas Ray and Amy Karlisl. All together there were 51 on the tour bus. We all had a great time and didn’t win big bucks, but we didn’t lose a lot either. First time I have ever been there and loved it. Alice Lee Thomas has returned home. Grayling was admitted to the emergency room at Hardin Memorial Hospital and released last week. Last Saturday, Lane Lincoln was the host of the Louisville/Lexington District Fall Gathering. Bishop Marvin Frank Thomas was also present at the event. Sunday, November 22 at 2 p.m. will be Missionary Meeting. Sunday, November 22 will be a special program entitled “Reverend Kenny Carter celebrating 25 years preaching God’s Word.” The program will be held at First Baptist in Hodgenville at 4 p.m.
Relay for Life – Becky’s Team will have a chili supper and bunco fundraiser event from 5 to 6:30 p.m. on November 13 at the Adult Day Care center. Cost is $10 to play bunco and $6 for chili, drink and a dessert. The team will also have a tree to bid on during the Festival of Trees event in Hodgenville. For more information call 270-765-9310. Amateur radio technician license classes will be held on Saturdays through November 14 from 9 to 11 a.m. The class will be held at the Hardin County Emergency Services building on 170 North Provident Way in Elizabethtown. For more information email w8wn@arrl.net or call Shelby Ennis at 270-737-8631. Seventeen Captain Jacob Van Meter Chapter members attended the DAR meeting on October 23 at the Brown Pusey House in Elizabethtown. Joyce Cowley provided the music and began the day on the piano with a medley of “God of Our Fathers” and “Eternal Father Come Strong To Save”. 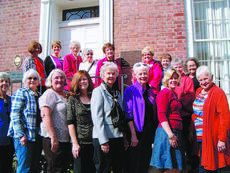 Sunrise Volunteers had their semi-annual meeting October 13, in the chapel at Sunrise Manor. Before the meeting started Sunrise Manor provided us a very nice meal after which the meeting started. Three new officers were installed. New president Ruth Ann Brown, first vice president, Sybil Skaggs and second vice president is Candy Vincent. All officers began their terms following this meeting. The annual New Haven Veterans Day program will be held Wednesday, November 11 at New Haven City Hall. The event will begin with a prayer service at 11 a.m. followed by a free lunch that is sponsored by the Lincoln Trail Gun Club and catered by Howie’s Restaurant. The Historical Preservation and Military-Veterans Center will be open to the public until 4 p.m.
For more information about the event call City Hall at 502-549-3177 or Tessie Cecil at 502-286-5121 or 502-827-0003. 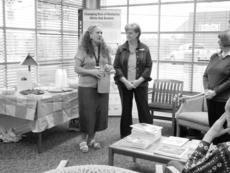 A dual reception was held at the LaRue County Public Library, hosted by Friends of the Library. A meet and greet for public officials to come and see the vital role our public library plays in our community, as well as celebrate Virginia Napier, bookmobile librarian, receiving her certification as a master librarian. 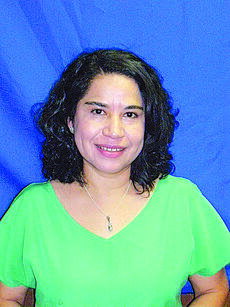 Marisela Royal has been selected as the October Employee of the Month for Nationwide Uniform. Royal has been employed with Nationwide since August of 2014 and is currently under the supervision of JoAnn Pearman in the trouser department. Royal will receive a special award for her dedication and service.